The Illinois Capitol building in Springfield, Ill. Updated 4:10 p.m. March 17, 2011 with Gov. Quinn's comments. Gov. Pat Quinn says he opposes a package of budget cuts proposed by Illinois Senate Republicans. The Chicago Democrat said Thursday the "foolhardy" cuts would kills jobs and weaken the economy just as Illinois recovers from a recession. The Republican plan includes cuts to education, health care and local government. They estimate the savings at $6.7 billion. The two biggest pieces are the most difficult. The Republicans want to cut government pensions, although Illinois Constitution bars reducing retirement benefits for current employees. They also propose cutting health services to the poor, which could be a slow, complicated process. The plan also calls for across-the-board spending cuts and a $725 million reduction in education funds. 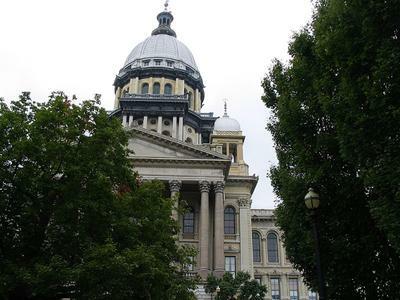 Republican state senators say they're willing to cut education, health care and local government aid to balance the Illinois budget. Senate Republicans outlined their proposal Thursday. Minority Leader Christine Radogno says each idea is backed by at least 15 Republican senators - or half the number needed to pass. They estimate the savings from their plan at $6.7 billion. The Republican plan also calls for across-the-board spending cuts and a $725 million reduction in education funds.